Filipinos are renowned all over the world for their technical expertise, which is mostly due to the quality education provided by several educational institutions in the country. The University of Batangas considers itself one of the frontrunners for Technical Education. The department is fully recognized and accredited by Technical Education and Skills Development Authority (TESDA), the government regulating agency for institutions offering Technical Vocational Education (TVET). All the instructors are holders of National Certifications Level 1, 2 and 3 and Assessor/Trainers of different qualifications. Instrumentation Technology The program covers an extensive selection of basic and advanced instructions combined with practical exercise which allows optimum training in Pneumatics, Electro-Pneumatics, and Programmable Logic Controller. 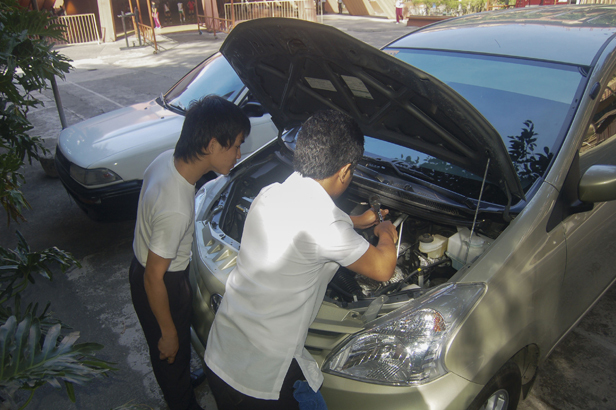 Automotive Technology The program aims to provide students with necessary skills and technical know-how in servicing and repairs of automotive vehicle. The program equips students with the knowledge in basic automotive hand tools and their usage, under chassis, engine component parts, accessory system, and welding and fabrication of the entire vehicle. Drafting/CAD Technology The drafting / CAD technology covers the computerized and manual of working and detailed drawings for engineering, construction, manufacturing, or other project based on designer’s sketches and specifications, and preparation of charts and working drawings for other purposes. This program aims to provide skills and knowledge for students through lecture and computer hands-on.